There were nearly 75 million FTTH subscribers worldwide at the end of 2012, but only 10.3 million of them are in Europe, according to the latest update to the FTTH Council's "FTTH Ranking" unveiled at the FTTH Conference in Munich. The figures show that Europe is still playing catch up when it comes to FTTH. But it’s making valiant efforts. The number of homes passed increased by 41% in 2011, and the number of new subscribers was up 28%, says iDATE, which compiles the market panorama data on behalf of the FTTH Council Europe. It is good to see that FTTH adoption continues to grow even in time of economic uncertainty,” said Hartwig Tauber, director general of the FTTH Council Europe. However, he admits that growth is slower than expected, largely because of the economic downturn. Adoption is still the big challenge. As deployments outpaced the number of new subscribers, the overall subscriber penetration rate fell from 20.3% in 2010 to 18.4% at the end of 2011. “People look at the take rate and say that it proves that people don’t want fiber, but if you look at the panorama you can see there are countries where the take rate is very high, especially in the more mature markets where they have had fiber for some years,” Tauber points out. Looking at the detail of what’s happening within Europe reveals huge variations between different countries. 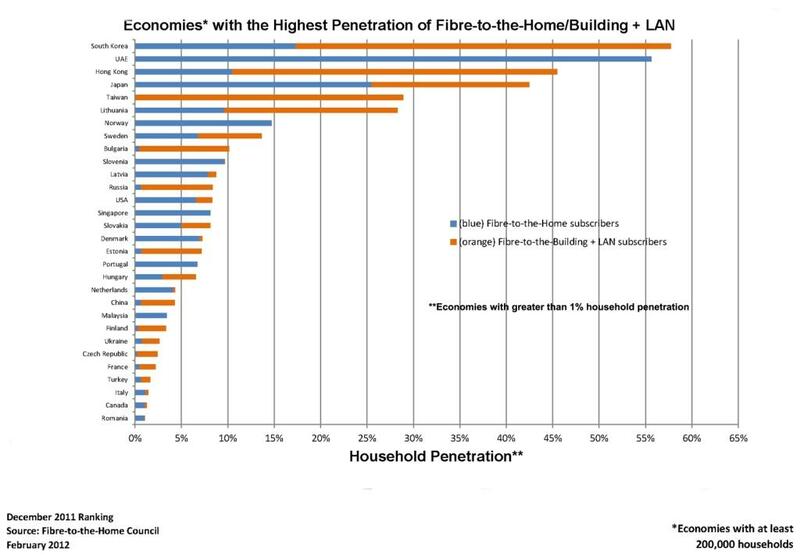 Twenty countries meet the criterion to be included in the ranking (see figure); a country must number at least 200,000 households with more than 1% of them connected to a fiber network using FTTH or FTTB. There were no new entrants to the ranking this year. Lithuania still leads the ranking with 28.3% market penetration, and Norway has moved up into second place at 14.7%. Below them there has been some shuffling in the ranks with Portugal and Turkey showing the highest growth rates. In absolute numbers, Russia is the largest market by a considerable margin, counting 4.5 million subscribers – nearly half of the region’s total.France is the second largest market, followed by the Ukraine, Italy, and Portugal. Large economies like France and Italy languish at the bottom of the ranking; in fact, Latvia and Turkey moved ahead of Italy.Spain was one of the fastest growing markets for FTTH, and looks set to join the ranking soon. But the usual offenders are still missing, namely Germany and the UK. For the first time, the UK earned a mention, being one of the countries with a high growth rate, but it is starting from a very small base. By the end of 2011, the UK had an estimated 7,750 FTTH/B subscribers, and still has the dubious distinction of being the fiber laggard of Europe. In other data revealed today, the Broadband Forum reported that "hybrid FTTx" — referring to technologies like fiber to the node (FTTN) and fiber to the cabinet (FTTC) that use both copper and fiber in the access network — is leading growth in European broadband access, and is expected to dominate growth for the next five years. Almost 4 million FTTx subscribers were added in Europe in­ the year to September 2011. Hybrid FTTx counted 9.77 million users at the end of Q3 2011, while full FTTH rose by almost 742,000 in the 12 months to 3.17 million users. The numbers cannot be compared directly to the FTTH Council Europe figures because they use a different timeframe and a different number of European countries, but give a good indication of the growth of hybrid copper-fiber technologies relative to full FTTH. However, it’s worth pointing out that the market for DSL lines is still growing and remains the largest broadband technology in use, increasing by 9.2 million lines in the year to September to a total 125.81 million, says the Broadband Forum. Cable networks are also adding significant numbers of new subscribers: 1.98 million broadband users in the 12 months to September 2011, giving a total subscriber base of 25.77 million.